Reassembler - Emulation & Decompilation: The Best OutRunners: Who Made OutRun? The Best OutRunners: Who Made OutRun? Video game publishers were secretive in the 1980s. In a highly competitive market they didn't want star developers poached by rivals. Whereas by the mid 90s, titles like Daytona USA included a full credits list, the 1980s saw developer credits constrained to Easter Eggs and cryptic initials on the high score table. Unfortunately, as a result of this, many developers remain uncredited for their work. 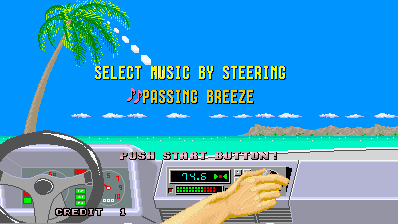 Nevertheless, it's a fun challenge to establish the development story of an influential title like OutRun! Youji Ishii, who joined Sega in 1978, first worked with Yu Suzuki on Hang-On. He is notable for his hands-on role developing Flicky and Fantasy Zone. He project managed OutRun and handled other elements of the production. He was effectively Yu Suzuki's boss. His role would be equivalent to an Executive Producer or studio head in western development terminology. 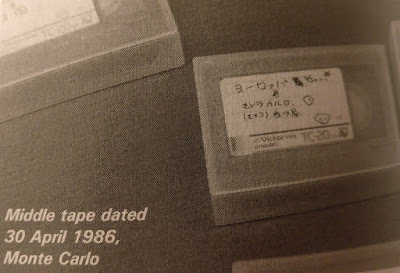 In Szczepaniak's interview in The Untold History of Japanese Game Developers Vol 3, Ishii humbly credits much of the creative vision for OutRun to Yu Suzuki noting, "I mostly left things up to Suzuki. So it's actually correct to say Yu Suzuki was the one who deserves credit". Ishii doesn't receive a credit on the high score table despite managing the project. Sega's development studio in Haneda, located next to Sega HQ. This is where OutRun was developed. OutRun was developed by a small team over the course of eight to ten months. The team consisted of four programmers, five graphic designers and one sound creator. (The Making of OutRun). Space Harrier's code contains a hidden November 1985 date, and OutRun's September 1986. So presuming the core team moved straight from Space Harrier to OutRun, that confirms a 10 month development cycle. There are remnants of Space Harrier's assets in OutRun including the Space Harrier font, and a sound sample so this seems a reasonable assumption. In April 1986, approximately 5 months into production, Ishii and Suzuki embarked on a European roadtrip to scout locations for OutRun. The original plan had been to travel to New York and cross America, due to the influence of The CannonBall Run movie. But Ishii claims Hayao Nakayama, the head of Sega, thought this would be too dangerous. (Untold History Vol 3). Suzuki's recollection of events differs, "I realised, once I’d arranged everything, that the scenery along the [pan-America] course actually doesn’t change very much, so I revised my plan and decided to collect data in Europe instead." (The Making of OutRun). This change in focus mid-development perhaps explains why OutRun starts with the California influenced Coconut Beach, before becoming more European in nature. Both Ishii and Suzuki cite the Romantic Road in Germany as a particular influence. It's reasonable to assume that Coconut Beach was developed before the trip took place, as there's an early test variant of that level still present in the ROMs. So now we come to decipher the cryptic Best Outrunners list, which offers seven entries from the overall team size of ten. Like all good games, it starts easily enough, but soon gets tough! 1. First up, needing no introduction, is Yu Suzuki (YU.) Yu Suzuki acted as the creative lead and planner on OutRun, but was also a hands-on programmer. He mentions, "I wrote all of the important planning and programming parts myself; I don’t think anything was really influenced by the development staff." (The Making of OutRun). 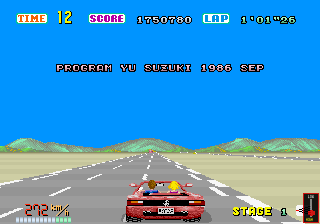 However, the creative influence of the OutRun team was perhaps more prominent than Suzuki recalls, as we shall see. There's no doubt that Suzuki was the lead visionary from a technical and creative standpoint. It's his name that's present in the Easter egg, indicating his role in developing the program code. With such a small development team, it's clear that many of the individuals wore multiple hats as a result and Suzuki is no exception. It should also be noted that Suzuki composed a couple of the music tracks for Space Harrier including Ida and Valda. The Sega teams contained multi-talented individuals. 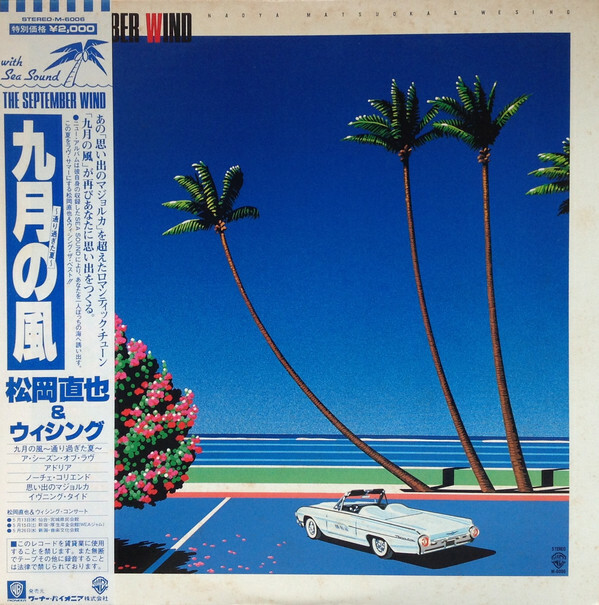 Suzuki's creative reference points included The CannonBall Run movie, his European roadtrip with Ishii and the art of Hiroshi Nagai. And within Sega there was a business objective to better Namco's Pole Position, which arguably it did depending on which set of figures you believe. Some cite over 20,000 OutRun machines sold, whereas others over 30,000. 2. The seconds entry reads BIN. This is Satoshi Mifune, who likes to be known as Bin-Chan. (4gamer). He joined Sega in April 1985, and would have been just 18 years old at the time. (AM2 Web Archive). His first project was a supporting role on Hang-On, where he first worked with Yu Suzuki. From there, Mifune programmed high profile projects including Space Harrier, OutRun, AfterBurner, Dynamite Dux, Turbo OutRun through to Virtua Striker and even Shenmue! As we've covered on this blog, he's credited in hidden debug text within the game relating to the colour palette. 3. 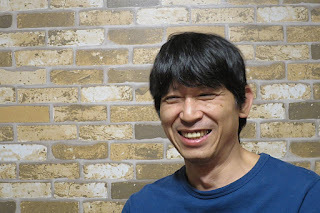 KAG is possibly Takafumi Kagaya, an AM2 designer credited on Daytona USA, Virtua Cop and Virtua Figher amongst other titles. Entering KAG on the Daytona USA high score table plays a hidden jingle. It's not unreasonable to assume he could have worked on OutRun, but I've not seen concrete proof of this. 4. 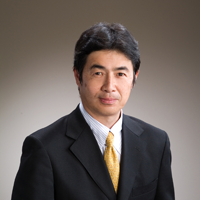 MIY is Hiroshi Miyauchi, more commonly known as Hiroshi Kawaguchi. 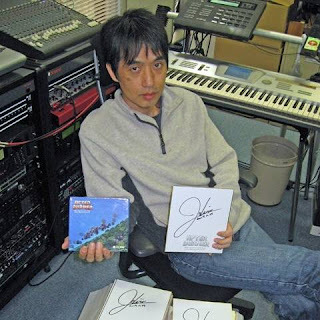 One of Sega's longstanding and prolific composers, if not one of the most famous video game composers of all time. Continuing the multi-talented trend of the team, Hiro originally joined Sega as a programmer, impressing Yu Suzuki with his assembly skills at interview. It was common for composers to manually transcribe their music into assembly macros and even write sound drivers at Sega during this period, so perhaps this isn't surprising. (The Rock Stars of Sega). In terms of creative decision making, there is light-hearted disagreement with regard to who suggested certain features, contradicting Suzuki's claims that he didn't rely on the development team for input. During a revealing interview fellow Sega composer Takenobu Mitsuyoshi jokes that Suzuki usually liked to assume ownership of ideas. 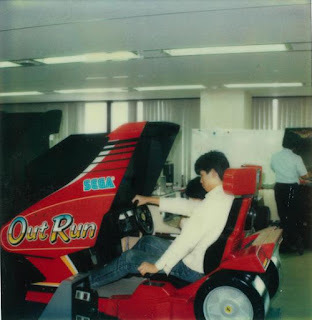 Hiro laughs when he recalls "Yu Suzuki used to say he came up with [the idea of OutRun's music select] himself." Before adding, "but I seem to remember the designer creating that radio screen and saying, 'hey, if this is a radio, you should be able to select your own songs!' I do remember, however, that the screen originally didn’t show the hand. The original design was just the car’s dashboard. But once you were able to select songs, I asked Yu Suzuki whether we should have a cursor or some indicator on-screen to show people they could choose their music. Ultimately I'm the one who decided we didn’t need to do that, though." (The Rock Stars of Sega). 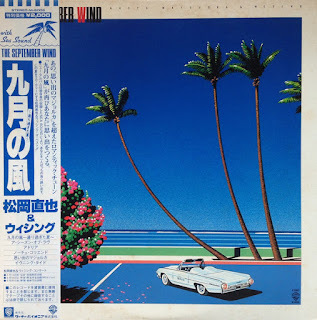 Hiro references Naoya Matsuoka and Cassiopeia as direct influences on OutRun's soundtrack. "If I had not heard Mr. Naoya Matsuoka's songs, I don't think OutRun's music would have been born" (Sound Creator Interview). 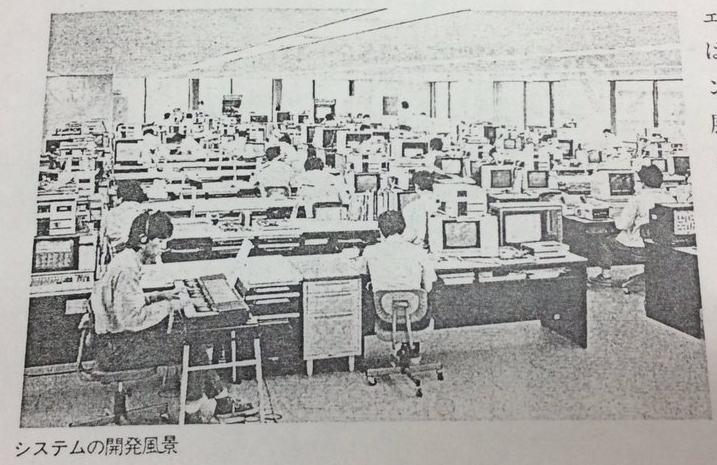 The following image shows Sega's offices around the development of OutRun (Twitter). Hiro can be seen in the foreground playing the keyboard wearing casual clothes, unlike his colleagues. On the right is Mr. Yamamoto who was responsible for transcribing the sound data for OutRun. 5. MAT is programmer Tetsu Matsushima. Like many others on the team he worked across Space Harrier, OutRun and AfterBurner. (MegaDrive Collected Works) He went onto work for Rutubo games, which produced the arcade perfect Saturn ports of the aforementioned titles. 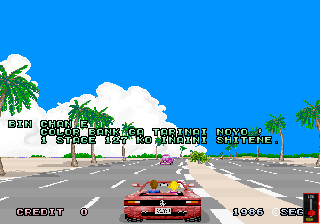 Whilst Suzuki claimed, "The [OutRun] game development team was made up of people who happened to be available at the time, so I wasn’t able to assemble the team according to my wishes", (The Making of OutRun), this must be taken with a grain of salt given Hiro, Mifune and Matsushima appear to be a close-knit unit migrating from Space Harrier onto OutRun, before decamping to their skunkworks Studio 128 office to develop AfterBurner. 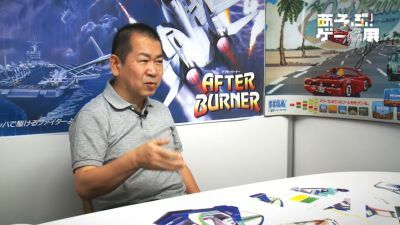 (AfterBurner II - Developer Interviews). The pixel art style of these three titles is also consistent, which would suggest many of the artists moved from one project to the next. Sadly, I can't establish who these individuals are. Maybe they were members of the art team, of which I can find no information at all. Even when John Szczepaniak directly asked Youji Ishii, on my behalf, for the remaining developer credits during an interview in The Untold History of Japanese Game Developers Vol 3, he was unable to recall all the names. For now, the road sadly ends here. Hopefully one day I'll uncover more information and update this article. If you have any further information, please let me know in the comments below. Dec 1986 - AfterBurner Development Starts. Team relocates to Studio 128.